Turning up at the track friday morning the conditions were perfect. The track was almost dry and we were all feeling highly confident that we would learn a huge amount about the car and its setup in the following testing sessions. The Paddock was full with other Porsches both boxsters and 924s as well as a huge range of single seaters and GT4/GT3 cars. We were lucky enough to have Franks motorhome with us and our amazing coffee machine from sponsors the Chevington group which proved to be a hugely popular over the weekend! 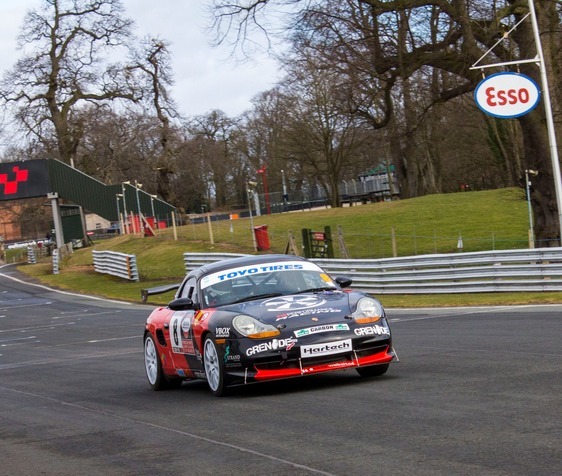 With all checks complete on the car and a few minor setup changes Toby was let loose on the track. The car sounded incredible as it came past the pits and as a team it was a very special moment to see our car out on track at last. unfortunately it would be the only time we would see it on track as an oil issue carried over from the week before put an end to our running. As disappointing as it was we could take a lot of pride in the way the car was performing and the feedback from Toby was that the car was set up to perfection. Having said that we got some stunning footage from the Racelogic HD2 unit given to us by Racelogic which will be an incredible tool to help Toby grow as a driver. After retiring Toby was then poached by another team to help set up their car and it was useful track time for him extracting podium pace from the other car. Saturday and race day had arrived the paddock was buzzing and it was clear everyone could not wait to get started. There was a morning practice session for the cars and many chose not to go out as with more rain overnight the track was very greasy. Scrutineering was underway and all the cars made their way over to be checked including the Pie Performance Car. Whilst we still had to push it over we were pleased with how scrutineering went and there were many remarks on how well our car had been put together. Qualifying was soon upon us and with the track now bone dry it was a real opportunity for all the teams to show off their cars and drivers true potential. It was Adam Southgate who had not tested at all the day before that set a stella qualifying pace beating his rivals by over a second and leaving a few of them to eat some humble pie! The first race came around quickly after qualifying and what a race it was. Adam Southgate lined up alongside James Coleman with Nick Hull in third place. What happened next caught everyone by surprise with a huge crash into turn one leaving four cars out of action and providing the crowd with one hell of a spectacle. Adam went on to win the race by a country mile with impressive drives from Jayson Flegg and Alex Stocker to complete the podium. With everyone back in the paddock after the carnage of race one Pie Performance featured strongly. Helping not one but two cars get back out for race two fitting the exhaust from our racing car to Adam Southgates and donating our front bumper and splitter to Alex Stocker. As a business one of the main reasons for us getting into racing was to help the championship and we spent Saturday doing just that! Amazingly all but one of the cars from the first race made it out to the second and whilst not as eventful as the first the second race provided wheel to wheel action with Adam Southgate driving into the distance once more and leaving the rest to battle it out in nose to tail finishes for second placed Alex Stocker and James Coleman who managed to rebuild his car in impressive style for the second race. It was great racing all round and we as Pie Performance are delighted to now be a part of such a fantastic championship. The camaraderie in the paddock was second to none and we very happy that we could help two cars get back on track for the second race. However the racing wasn't the only thing to take away from the weekend. Our chosen charity Speed of Sight were with us to take part in all of the racing action and for us to present them with a cheque for £900 raised from our Race Car Launch in February. 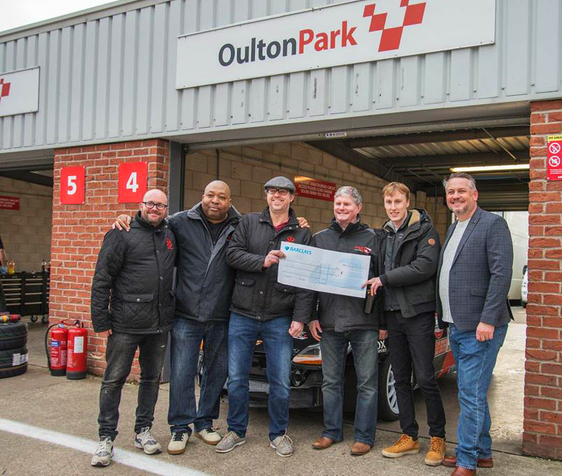 This will go towards getting more disabled and blind drivers out in racing car experiences and we are very proud to be supporting such a worthwhile charity. Thank you for taking the time to read our blog we will be posting another one next week!